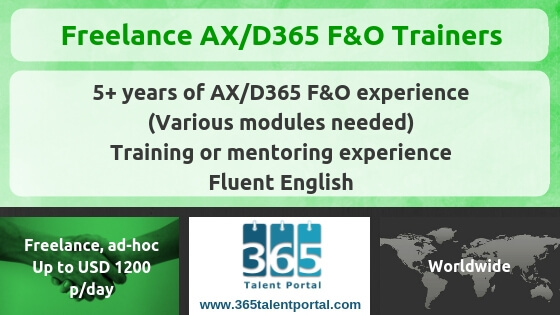 We have a great opportunity for Freelance Dynamics 365 F&O Trainers worldwide to deliver training workshops on a very flexible basis. 365 Talent Portal have been providing leading training organizations with Dynamics 365 trainers for several years. The demand for skilled freelancers has been increasing and we have some exciting new projects, so we need more experts to join. Successful candidates will regularly be offered opportunities to deliver ad-hoc Dynamics 365 F&O training courses that match their expertise. This is a long-term, flexible, freelance engagement which can easily be worked around other contracts. The workshops typically last 3 to 5 days. You are always free to accept or decline a workshop delivery based on your availability and wishes. The deliveries can be virtual or on-site. On-site deliveries can be anywhere in the world, though you are free to decide to only deliver in certain locations. We also regularly get requests for Dynamics 365 F&O training content creation, so if that’s something you want to explore, you may get a chance to do this too. The rate range for these training deliveries is USD 900-1200 per day (to be negotiated based on your experience). Travel expenses are fully reimbursed. For more Dynamics 365 jobs, click the below button and register with us. 365 Talent Portal is the Microsoft Dynamics platform that saves Dynamics Partners & End-Users over 50% in recruitment fees. Thousands Consultants have joined us for free Dynamics online training, events, downloads and great jobs. It’s free for Consultants, while hiring companies pay a small subscription fee to advertise and directly contact them.